© Barsoum et al. ; Licensee Bentham Open. * Address correspondence to this author at the Department of Medicine, Staten Island University Hospital, North Shore-LIJ Health System, Staten Island, New York, USA; Tel: 3476669321; Fax: 7182268695; E-mail: ebarsoum@nshs.edu. Elderly patients with unstable coronary artery disease (CAD) have better outcomes with coronary revascularization than conservative treatment. With the improvement in percutaneous coronary intervention (PCI) techniques using drug eluting-stents, this became an attractive option in elderly. Minimally invasive coronary artery bypass grafting (MICS-CABG) is a safe and effective alternative to conventional CABG. We aimed to explore the long-term outcomes after PCI vs MICS-CABG in ≥75 year-old patients with severe CAD. A total of 1454 elderly patients (≥75 year-old patients) underwent coronary artery revascularization between January 2005 and December 2009. Patients were selected in the study if they have one of the Class-I indications for CABG. Groups were divided according to the type of procedure, PCI or MICS-CABG, and 5 year follow-up. Among 175 elderly patients, 109 underwent PCI and 66 had MICS-CABG. There was no significant difference observed in both groups with long-term all-cause mortality (31 PCI vs 21% MICS-CABG, p=0.151) and the overall 5 year survival was similar on Kaplan-Meier curve (Log rank p=0.318). The average length of stay in hospital was significantly shorter in the PCI than in the MICS-CABG group (4.3 vs 7.8 days, p<0.001). Only 4.7% of the PCI group were discharged to rehabilitation facility compared with 43.9% of the MICS-CABG group (p<0.001). The rate of repeat revascularization was significantly higher in the PCI group than in the MICS-CABG group (15 vs 3%, p=0.014). Among elderly patients, long-term all-cause mortality is similar after PCI and MICS-CABG. However, there is a significantly higher rate of repeat revascularization after PCI. Keywords: Coronary artery disease, Elderly, MICS-CABG, PCI. The elderly have a higher prevalence of coronary artery disease (CAD) , this group of patients is progressively increasing. Despite the advantage of coronary artery revascularization in elderly patients [2-4], they have been steered towards percutaneous coronary intervention (PCI) as it is less invasive than coronary artery bypass graft (CABG) . Minimally invasive coronary artery bypass (MICS-CABG) became an attractive technique for coronary revascularization. Studies have showed MICS–CABG is as effective as traditional sternotomy-based CABG [6-9]. It has the advantage of being less invasive with faster recovery and shorter hospital stays [10, 11]. We explored the long-term outcome of PCI vs MICS-CABG in an elderly population. From January 2005 to December 2009, 1454 elderly patients (age ≥75 years) were identified as having coronary artery revascularization for CAD at Staten Island University Hospital (Staten Island, New York). Our study only included patients with class I indications for CABG (i.e. patients with 3 vessels CAD, left main disease or 2 vessels disease with significant proximal left anterior descending lesion). In addition, patients had coronary revascularization by PCI or MICS-CABG. Those who underwent sternotomy-CABG, concomitant valve replacement/repair and prior history of PCI or CABG were excluded from the study. We followed all included patients until June 2013. The primary outcomes were all-cause mortality and rate of repeat revascularization. After institutional review board approval, trained physicians using our hospital medical record retrieved demographic data, risk factors for CAD, co-morbidities, laboratory values, left ventricular ejection fraction, Canadian Cardiovascular Society (CCS) class and procedural information on each index case. Survival status was retrieved from our medical record and social security death index. Patients were divided into 2 groups according to the type of procedure and the baseline characteristics of the 2 groups were compared using the chi-square test for categorical variables and independent sample t-test for continuous variables. The distributions of continuous and categorical variables were represented as mean ± standard deviation, and frequencies and percentages, respectively. A multivariate Cox regression was performed to explain the association between mortality and several independent variables, which have a significant association with mortality or have a clinical importance. Survival analysis was conducted using Kaplan–Meier curves and the 2 groups were compared with the use of the log rank test. All statistical analyses were performed with the use of STATA version 13.0, College Station, Texas. There were 175 elderly patients, age ≥75 years, that underwent PCI or MICS-CABG who were included in the study. Among the entire cohort, 109 patients (62%) with mean age 80.6 ± 3.8 years underwent PCI and 66 patients (38%) underwent MICS-CABG with mean age 79.6 ± 3.8 years. In the PCI group, 84 patients received drug eluting stents (77%), 24 patients received bare metal stents (22%) and one patient received both types of stents. The mean number of stents used per patient was 1.5 ± 0.8. In MICS-CABG group, 54 patients (82%) underwent off-pump surgery; all patients underwent revascularization using left internal mammary artery (LIMA) as an arterial conduit and average number of grafts per patient was 2.5 ± 0.7. Baseline characteristics are summarized in Table 1. Patients who underwent MICS-CABG had a significantly higher history of dyslipidaemia (PCI-40% vs MICS-CABG-77%, P = 0.001) while patients with PCI had a significantly higher history of myocardial infarction (PCI-46% vs MICS-CABG-24%, P = 0.004) and higher usage of clopidogrel (PCI-93% vs MICS-CABG-74%, P = 0.001). The median follow-up was 4.9 years for all patients, 34 patients (31%) died in the PCI group and 14 patients (21%) died in the MICS-CABG group (P = 0.15). Fig. (1) summarized the overall mortality outcomes in both groups. Table 1. Baseline characteristics according to the type of procedure (Percutaneous Coronary Intervention, [PCI] versus Minimal invasive cardiac surgery [MICS-CABG]) in patients ≥ 75 years-old. The average length of stay in the hospital was significantly shorter in the PCI group, 4.3 ± 4.7 days, than in MICS-CABG group, 7.8 ± 7.4 days, (P < 0.001). In addition, 5 patients (4.7%) in the PCI group were discharged to a rehabilitation facility compared with 29 patients (43.9%) in the MICS-CABG group (P < 0.001). During the entire follow-up, 16 patients (15%) in the PCI group needed repeat revascularization, compared with 2 patients (3%) in MICS-CABG group, (P = 0.014). The Kaplan-Meier curve showed no significant difference in overall survival between both groups (log rank P = 0.318) (Fig. 2). 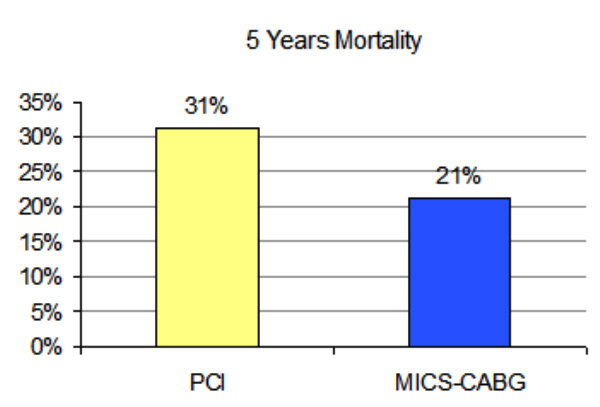 Long term mortal ity in elderly patients underwent PCI and MICS-CABG (P=0.150). By using a multivariate Cox-regression model for all-cause mortality among elderly patients, including all possible predictors of mortality, age and ejection fraction were the only predictors of mortality in our study population, but the type of the procedure was not predictive of mortality with a hazard ratio of 0.77 (CI 0.28-2.10) (Table 2). In our study, we compared 2 different procedures for coronary revascularization, PCI and MICS-CABG, in elderly patients with an average age of 81 years. We found that patients that underwent PCI had similar long-term outcome as MICS-CABG, there was no significant difference between both groups regarding all-cause mortality (31% PCI vs. 21% MICS-CABG; P = 0.15) and the overall 5 year survival was similar on Kaplan-Meier curves. Patients who underwent PCI had shorter hospital stay and less discharge to rehabilitation facility but had a higher rate of repeat revascularization. Many trials, including the SYNTAX (The synergy between percutaneous coronary intervention with Taxus and cardiac surgery) trial, comparing CABG with PCI showed all-cause mortality benefit and cardiac-related mortality benefit after CABG compared with PCI [12-16]. Similarly, the ASCERT (The American College of Cardiology Foundation and the Society of Thoracic Surgeons Database Collaboration on the Comparative Effectiveness of Revascularization Strategies) study was an observation study which showed that among elderly patients (age ≥65 years) with multivessel disease had lower mortality and a long term survival benefit after open thoracotomy CABG compared with PCI . In addition, in a meta-analysis of 10 randomized trials Hlatky et al. demonstrated long term mortality benefit after CABG compared with PCI in elderly patients ≥65 years . But, Alam , explored the outcome between PCI and CABG in elderly >70 years after revascularization for unprotected left main coronary artery disease, and found no significant difference between both procedures regarding all-cause mortality. Studies showed the rate of repeat revascularization is higher after PCI compared with CABG, in a meta-analysis of 9 observational studies, Benedetto  found the frequency of repeat revascularization was more than 3 times higher after PCI than CABG. Similarly, Bravata , in a systematic review of 22 randomized controlled trials found similar results after 5 years of follow up. Fosbøl  studied the rate of repeat revascularization in older adults with an average age of 73 years and found that advanced age has a lower rate of repeat revascularization after CABG. In addition, Harskamp  in a meta-analysis comparing minimally invasive CABG with PCI which in LAD disease only, found a higher rate of repeat revascularization after PCI. An angiographic patency study with consecutive patient undergoing MICS-CABG, showed patency of 100% for LIMA and 92% for all grafts, with 6 month computed tomography angiographic follow-up, conferring longevity to the CABG procedure and symptom free survival . Table 2. Multivariate Cox regression model for all-cause mortality among patients with age ≥ 75 years old underwent coronary revascularization. 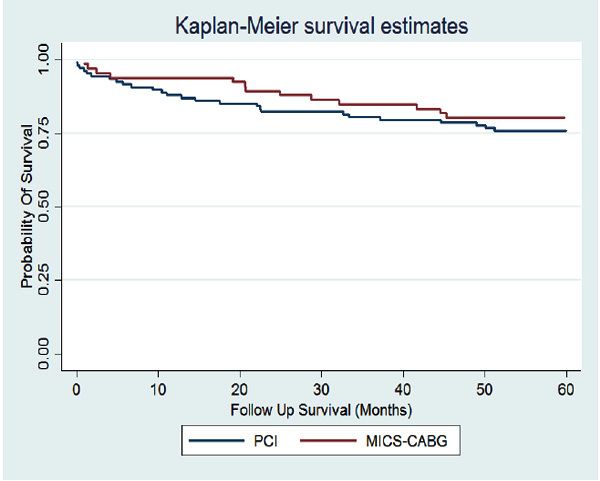 Kaplan-Meier curve of survival in elderly patients underwent PCI and MICS-CABG (P = 0.318). Elderly patients with CAD usually have co-morbid conditions and after sternotomy CABG they have a high incidence of complications and longer hospital stay than younger patients [24-27]. King  found the length of hospital stay after minimal invasive CABG and PCI is shorter than for sternotomy CABG; and Alam  found that elderly patients aged >70 years had an average hospital stay of 4.2 days, but longer hospital stay after sternotomy CABG (8.3 days). Quality of life is an important factor for the elderly. Bardakci , showed that octogenarians undergoing CABG are less likely to be discharged home compared with younger patients. Gopaldas , showed that 45% of elderly patients aged ≥80 years were transferred to rehabilitation or care facility after CABG. Although early recovery after MICS-CABG is a documented advantage over traditional CABG, not enough studies in the elderly have elucidated this. Our study has several limitations. First, because of the small number of patients, we could not carry out a subgroup analysis to explore the effect of procedure in patients with left main disease or 3 vessels disease alone. However, we repeated the statistical analysis after adding patients with previous history of PCI and the results were similar. Secondly, this study is non-randomized and retrospective in nature, we cannot exclude the possibility of selection bias. Third, we explored all-cause mortality without considering cardiac causes of death. Using the social security death index and medical records to detect the mortality, could lead to missing some outcomes. Among elderly patients who underwent coronary revascularization, there was no significant difference regarding long term all cause mortality or survival after MICS-CABG and PCI. However, patients who underwent PCI had shorter hospital stay and fewer discharges to rehabilitation facilities but they had higher rate of repeat revascularization. Further evaluation on a large scale in this group of patients is needed. J.T.M. reports lecture fees from Medtronic. All other authors have nothing to disclose with regard to commercial support. Chaitman BR, Bourassa MG, Davis K, et al. Angiographic prevalence of high-risk coronary artery disease in patient subsets (CASS). Circulation 1981; 64(2): 360-7. Amin AP, Nathan S, Prodduturi P, et al. Survival benefit from early revascularization in elderly patients with cardiogenic shock after acute myocardial infarction: a cohort study. J Invasive Cardiol 2009; 21(7): 305-12. Dzavik V, Sleeper LA, Cocke TP, et al. Early revascularization is associated with improved survival in elderly patients with acute myocardial infarction complicated by cardiogenic shock: a report from the SHOCK Trial Registry. Eur Heart J 2003; 24(9): 828-37. Trial of invasive versus medical therapy in elderly patients with chronic symptomatic coronary-artery disease (TIME): a randomised trial. Lancet 2001; 358(9286): 951-7. Sheridan BC, Stearns SC, Rossi JS, D’Arcy LP, Federspiel JJ, Carey TS. Three-year outcomes of multivessel revascularization in very elderly acute coronary syndrome patients. Ann Thorac Surg 2010; 89(6): 1889-94. McGinn JT Jr, Usman S, Lapierre H, Pothula VR, Mesana TG, Ruel M. Minimally invasive coronary artery bypass grafting: dual-center experience in 450 consecutive patients. Circulation 2009; 120(11)(Suppl. ): S78-84. Hoff SJ, Ball SK, Leacche M, et al. Results of completion arteriography after minimally invasive off-pump coronary artery bypass. Ann Thorac Surg 2011; 91(1): 31-6. Chan V, Lapierre H, Sohmer B, Mesana TG, Ruel M. Handsewn proximal anastomoses onto the ascending aorta through a small left thoracotomy during minimally invasive multivessel coronary artery bypass grafting: a stepwise approach to safety and reproducibility. Semin Thorac Cardiovasc Surg 2012; 24(1): 79-83. Mack M, Acuff T, Yong P, Jett GK, Carter D. Minimally invasive thoracoscopically assisted coronary artery bypass surgery. Eur J Cardiothorac Surg 1997; 12(1): 20-4. Ruel M, Shariff MA, Lapierre H, et al. Results of the minimally invasive coronary artery bypass grafting angiographic patency study. J Thorac Cardiovasc Surg 2014; 147(1): 203-8. Lapierre H, Chan V, Sohmer B, Mesana TG, Ruel M. Minimally invasive coronary artery bypass grafting via a small thoracotomy versus off-pump: a case-matched study. Eur J Cardiothorac Surg 2011; 40(4): 804-10. Kappetein AP, Feldman TE, Mack MJ, et al. Comparison of coronary bypass surgery with drug-eluting stenting for the treatment of left main and/or three-vessel disease: 3-year follow-up of the SYNTAX trial. Eur Heart J 2011; 32(17): 2125-34. Hannan EL, Wu C, Walford G, et al. Drug-eluting stents vs. coronary-artery bypass grafting in multivessel coronary disease. N Engl J Med 2008; 358(4): 331-41. Malenka DJ, Leavitt BJ, Hearne MJ, et al. Comparing long-term survival of patients with multivessel coronary disease after CABG or PCI: analysis of BARI-like patients in northern New England. Circulation 2005; 112(9)(Suppl. ): I371-6. Brener SJ, Lytle BW, Casserly IP, Schneider JP, Topol EJ, Lauer MS. Propensity analysis of long-term survival after surgical or percutaneous revascularization in patients with multivessel coronary artery disease and high-risk features. Circulation 2004; 109(19): 2290-5.
 van Domburg RT, Takkenberg JJ, Noordzij LJ, et al. Late outcome after stenting or coronary artery bypass surgery for the treatment of multivessel disease: a single-center matched-propensity controlled cohort study. Ann Thorac Surg 2005; 79(5): 1563-9. Weintraub WS, Grau-Sepulveda MV, Weiss JM, et al. Comparative effectiveness of revascularization strategies. N Engl J Med 2012; 366(16): 1467-76. Hlatky MA, Boothroyd DB, Bravata DM, et al. Coronary artery bypass surgery compared with percutaneous coronary interventions for multivessel disease: a collaborative analysis of individual patient data from ten randomised trials. Lancet 2009; 373(9670): 1190-7. Alam M, Virani SS, Shahzad SA, et al. Comparison by meta-analysis of percutaneous coronary intervention versus coronary artery bypass grafting in patients with a mean age of ≥70 years. Am J Cardiol 2013; 112(5): 615-22. Benedetto U, Melina G, Angeloni E, et al. Coronary artery bypass grafting versus drug-eluting stents in multivessel coronary disease. A meta-analysis on 24,268 patients. Eur J Cardiothorac Surg 2009; 36(4): 611-5. Bravata DM, Gienger AL, McDonald KM, et al. Systematic review: the comparative effectiveness of percutaneous coronary interventions and coronary artery bypass graft surgery. Ann Intern Med 2007; 147(10): 703-16. Fosbøl EL, Zhao Y, Shahian DM, Grover FL, Edwards FH, Peterson ED. Repeat coronary revascularization after coronary artery bypass surgery in older adults: the Society of Thoracic Surgeons’ national experience, 1991-2007. Circulation 2013; 127(16): 1656-63. Harskamp RE, Williams JB, Halkos ME, et al. Meta-analysis of minimally invasive coronary artery bypass versus drug-eluting stents for isolated left anterior descending coronary artery disease. J Thorac Cardiovasc Surg 2014; 148(5): 1837-42. Engoren M, Arslanian-Engoren C, Steckel D, Neihardt J, Fenn-Buderer N. Cost, outcome, and functional status in octogenarians and septuagenarians after cardiac surgery. Chest 2002; 122(4): 1309-15. Weintraub WS, Jones EL, Craver J, Guyton R, Cohen C. Determinants of prolonged length of hospital stay after coronary bypass surgery. Circulation 1989; 80(2): 276-84. Peterson ED, Coombs LP, Ferguson TB, et al. Hospital variability in length of stay after coronary artery bypass surgery: results from the Society of Thoracic Surgeon’s National Cardiac Database. Ann Thorac Surg 2002; 74(2): 464-73. King RC, Reece TB, Hurst JL, et al. Minimally invasive coronary artery bypass grafting decreases hospital stay and cost. Ann Surg 1997; 225(6): 805-9. Bardakci H, Cheema FH, Topkara VK, et al. Discharge to home rates are significantly lower for octogenarians undergoing coronary artery bypass graft surgery. Ann Thorac Surg 2007; 83(2): 483-9. Gopaldas RR, Chu D, Dao TK, et al. Predictors of surgical mortality and discharge status after coronary artery bypass grafting in patients 80 years and older. Am J Surg 2009; 198(5): 633-8.